THE ABCs of PROSTATE CANCER, 1997, by Joseph E. Oesterling, MD. and Mark A Moyad, MPH. Available on Amazon.com and one of the best introductions to the disease, very well illustrated. Old, but still very good. A PRIMER on PROSTATE CANCER, 2002, by Stephen B. Strum, MD and Donna Pogliano, available on Amazon.com and replete with the very latest treatments. This book is for those who want more depth. The Fullerton Prostate Forum has a very large video library on important prostate cancer subjects featuring expert prostate cancer MDs/Researchers. We have selected a sampling of these videos and make them available to support groups and individuals who need them. These videos were made by Russ Thomas, a survivor and currently the CEO of the Prostate Forum of Orange County. It should be noted that these videos were made using a digital video camera and are available on DVD. These videos are not studio quality, but we believe they contain important information that is not readily available to most prostate cancer patients and Support Groups. 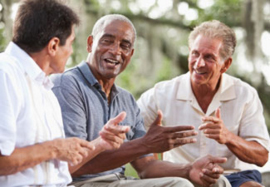 Prostate Cancer Support Groups should consider integrating these videos into their monthly program for a support group meeting. A complete list of videos including important PC topics featuring renowned/expert MD/Researcher is now available on our web site at: www.prostateforum.org. Just click on “videos”. “Focal Cryoablation and Cryoimmunotherapy”by Duke Bahn, M.D., speaking at the Forum on July 23, 2015. About 55 minutes. (Uploaded November 15, 2015.